Possible for bottom fishing. A surge in volume and price was seen in AHB, while staging for recovery from its consolidation phase. Improving RSI and MACD indicators currently signal reasonable entry level, with anticipation of continuous improvement in both momentum and trend in near term. 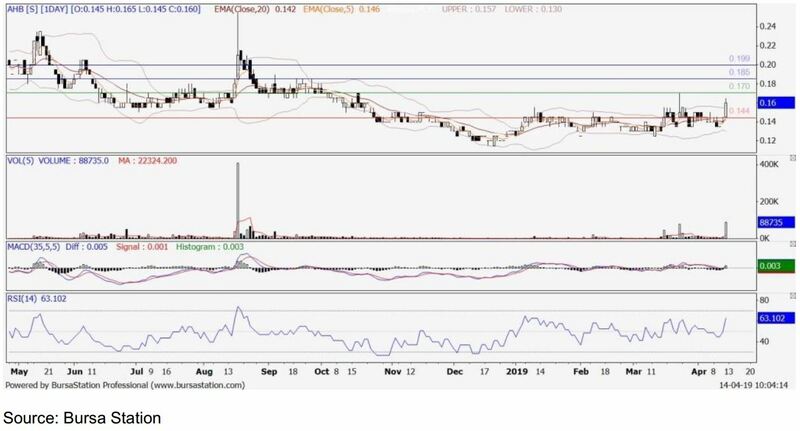 Should resistance level of RM0.170 be broken, it may continue to lift price higher to subsequent resistance levels of RM0.185 and RM0.200. However, failure to hold on to support level of RM0.145 may indicate weakness in the share price and hence, a cut-loss signal.